The Dairy Barn story begins in Switzerland in the late 1930's. Edgar Cosman, a proud and determined textile manufacturer, sent his 22 year-old son, Dieter, to work in the family's parachute cord factory in New Bedford, Massachusetts. When Edgar came to the States for a visit with a ticket to return on the cruise ship Normandy, World War II broke out and the Normandy was commandeered into service for the military. Edgar found himself stranded in New York and decided to buy a dairy farm on Long Island. The farm was losing money. Edgar Cosman left it up to his son Dieter to manage the failing East Northport milk farm and make it profitable. This was 1939, by the late 1940's Dieter had developed the Oak Tree Farm Dairy into a thriving wholesale milk business. Okay, you must be saying to yourself, but what does this all have to do with Dairy Barn? Good Question. By the late 1950's, people were no longer interested in having their milk delivered to their homes, so once again Dieter Cosman needed to reinvent his business. That's when Dieter came up with the concept of a "drive- thru" convenience store. The first Dairy Barn store opened in 1961, and was popular right from the start. It looked just like the ones you see today, from the barn-shaped store with the little red silo, to the two canopied driveways, Customers place and receive their orders-right from the comfort of their cars. 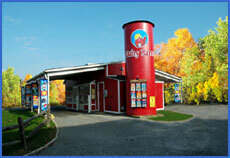 It is no wonder that today there are 5 Dairy Barn stores all over Long Island, stretching from Massapequa to Northport.